SHREVEPORT, LA — Students at Centenary College have the opportunity to turn their best business ideas into cash prizes this spring by participating in CentTank, a business pitch competition hosted by the College’s Frost School of Business and sponsored by Shreveport’s Entrepreneurial Accelerator Program. The CentTank competition kicks off with a reception and networking event in Centenary’s Whited Room on Thursday, January 17 from 6:00 to 8:00 p.m. Centenary president Dr. Christopher L. Holoman will welcome participants, and several local professionals, including Centenary alumni, will introduce the process for creating a successful business pitch. 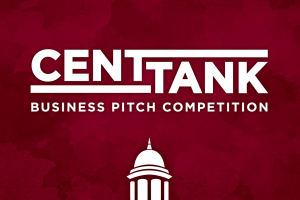 Current Centenary undergraduates can form teams of up to five participants and create business pitches from almost any industry for the CentTank competition. A series of workshops, mentoring sessions, and networking opportunities throughout the spring semester will prepare students for the final pitch competition and awards dinner in April 2019. A total of $4,500 will be awarded, with $3,000 going to the first prize winner. Local businesses and professionals can get involved in the CentTank competition as sponsors and mentors. For more information, contact Dr. Elaine Labach, William J. Atkins Endowed Dean at the Frost School of Business, at elabach@centenary.edu. For full details on CentTank, visit centenary.edu/centtank.